Most general contractors manage their construction projects; in this context, they fill the role of contruction managers. Construction managers are also known as construction superintendents, project managers, construction supervisors, or project engineers. They are responsible for planning, directing, coordinating, and budgeting construction projects, which may be residential, commercial, or industrial in nature. 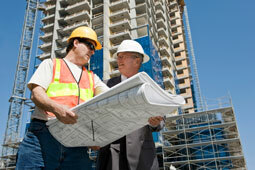 Construction managers also select, hire, and oversee specialty trade contractors such as plumbers and electricians. They determine the most cost-effective and time-efficient building schedule, determine the best way to get materials to the construction site, and may supervise the hiring of new construction workers for the project. They must obtain all necessary permits and licenses, and oversee compliance with building and safety codes. 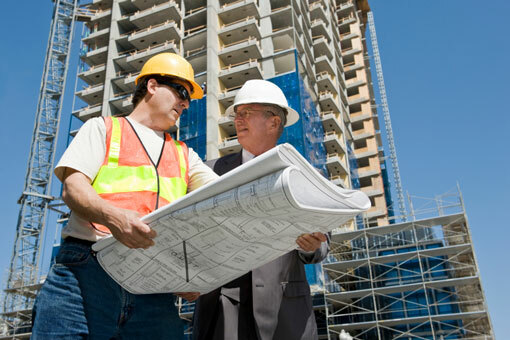 Construction managers manage the project from conceptual development to the final construction, with the goal of completing it on time within the set budget. Often there is more than one construction manager working on a large project such as an office building or industrial complex. In this case, different managers handle the stages of site preparation, building construction, and building systems. Site preparation includes clearing and excavating the land, installing sewage systems, landscaping, and road construction. Building construction includes laying foundations and erecting structural framework, including floors, walls, and roofs. Building systems include fire protection and electrical installation, as well as plumbing, air conditioning and heating system installation. Construction managers typically work out of a main office or a field office, but might travel considerably when monitoring more than one site or managing overseas construction. They may be on call 24 hours a day for the duration of the project and often have to deal with delays, inclement weather, and site emergencies. Although skilled and very experienced workers in construction-related fields may advance to construction manager positions, employers are increasingly looking to hire those with at least a bachelor's degree in a related field such as construction science, construction management, building science, or civil engineering. Often an associate's degree and years of experience may substitute for a bachelor's degree. Several colleges also offer master's degree programs in construction management, and graduates from these programs are often hired by very large construction companies. Construction managers must be knowledgeable about contracts, plans, specifications, and regulations. They should be flexible, able to work in a fast-paced environment, decisive, able to multi-task, and have good oral and written communication skills. It is also increasingly beneficial to be fluent in both English and Spanish, as a large proportion of construction workers speak Spanish as a first language. Certification is not required but may be obtained on a voluntary basis through the American Institute of Constructors or the Construction Management Association of America. Highly experienced construction managers may become independent consultants or start their own construction management services. Faster than average job growth is expected, and opportunities will be best for those with construction experience and a bachelor's degree. For information about voluntary certification, please visit the American Institute of Constructors and Construction Management Association of America websites.